This holiday season add a personal touch to your gift giving with homemade edible treats. Cookies, fudge, and brittle, to name a few, all make delicious gourmet offerings. Food gifts work well for everyone on your list and are fun and inexpensive to make. So instead of fighting the crowds at the mall spend some time in your kitchen. Maybe even get the entire family involved. Remember all the seasons best recipe can double as gifts; so as you are making something for your office party make a little extra for your neighbor. Something I always like to have on hand this time of year is mixed nuts. 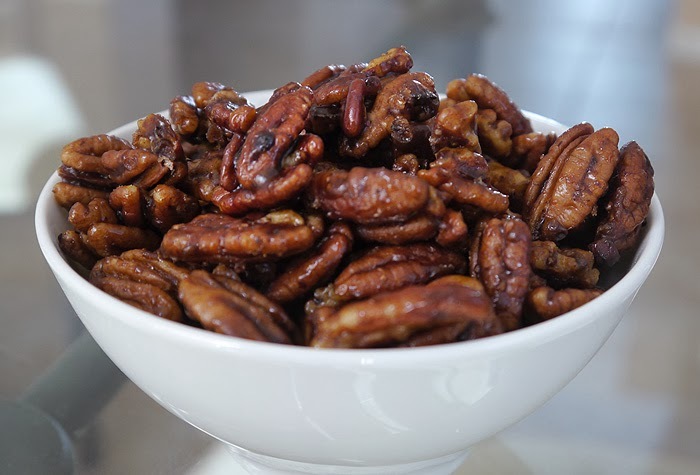 Salty, sweet, spicy party nuts, wrapped up in a nice bowl makes a tasty gift. One of my favorite recipes is the one below by Alton Brown. Don't let the dried orange peel deter you from making these amazing nuts. It can easily be found, along with all the other ingredients, at Whole Foods Market. To help with your shopping this holiday season enter below to win a $25 Whole Foods Market gift card. I love the use of the orange peel! I'm going to have to try these! These look delicious! I wonder if they would be good on a salad too! Candied organic orange peel dipped in bittersweet chocolate. (I also like making candied lemon peel, tangerine, etc.) I keep some to snip into little pieces and use in baking with whole grains. It seems to taste best at holiday times! My favorite edible gift is definitely chocolates or homemade fudge-- so delicious! Thanks for the chance to win! My favorite edible gift to get is my mom's fudge.... it is on it's way! This preggo mama can't wait. love to give and receive very good coffee. I really like giving/getting an awesome baked good! I follow u on pinterest - deets in the RC box. My favorite holiday food is Snickerdoodle Fudge! i love to get chocolate covered fruit!